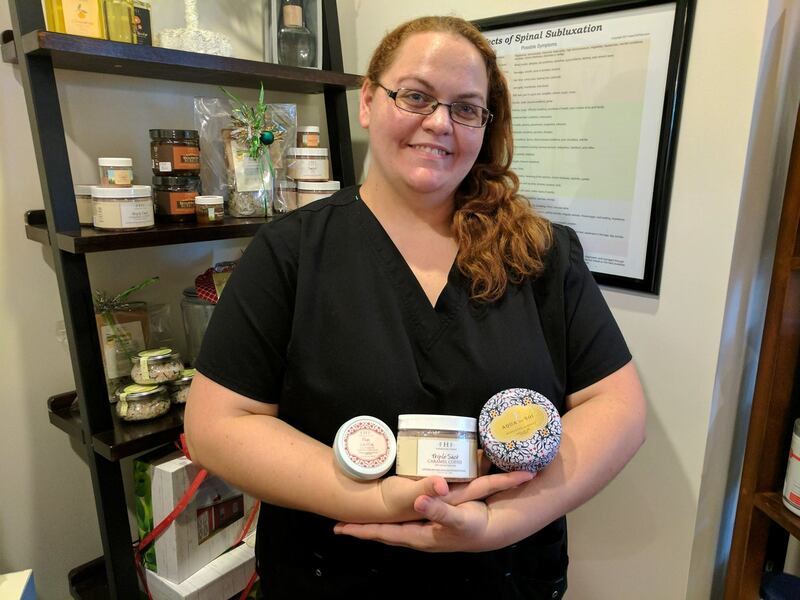 My absolute favorite product is the “Your New Medicine Cabinet” Wellness Basket! With great HEALTHY substitutes for Neosporin, Pepto Bismol, Aspirin and Ex-Lax, I’ve got all I need to care for my kids! I also love the Aqua de Soi Lavender Provence candle. It is such a relaxing, pleasant scent, I can’t wait to burn it in my bedroom when relaxing. My last pick is the Plum Chiffon Shea Butter Balm. It is such a light scent paired with a wonderful healing balm, and my elbows can’t wait to be slathered in it! The Mistletoe & Holly soy candle reminds me of Christmas as a child with my grandma & pappy. I chose the Farm House Fresh Plum Balm for how soft it makes my skin feel plus it is a nice glide for massage. The FHF Triple Shot Sugar Scrub is great because it smells amazing. Since caramel & coffee are 2 vices that aren’t good for you it’s a nice alternative to get to have them in a healthy scrub! I love the Terranova Rain lotion because it’s a very clean and fresh scent and the lotion is a great moisturizer – lasts a long time! I have been wanting some nice slippers for a while, and the Sonoma Lavender slippers not only smell wonderful and are very soft, they’re also a great massager for your feet, thanks to the flaxseed inserts! The perfume essences in Lotus Blush and China Rain are great scents for people (like me) who may not want something overly flowery-smelling. . . they’re light and are naturally derived – a win/win! Like Oprah, I love all the Farm House Fresh masks and use one every week! My New favorite thing is Green’s First Female Menopause Formula-Love it! Also, our new soy candles are amazing-I picked Day at the Spa by Sugar Belle with a 70 hour non-toxic burn; really lovely. 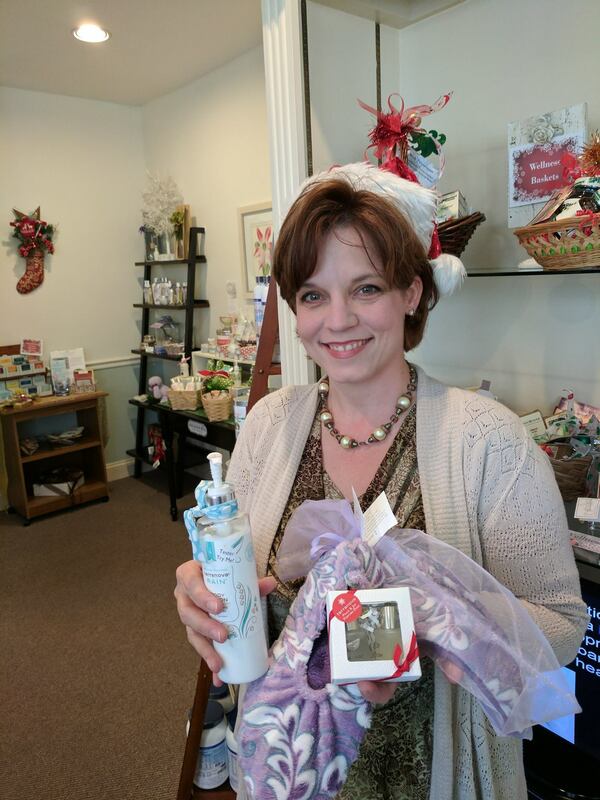 The big basket I’m holding is our Lavender Basket with a Heat Therapy Blanket, essential oils, lotion and body milk. 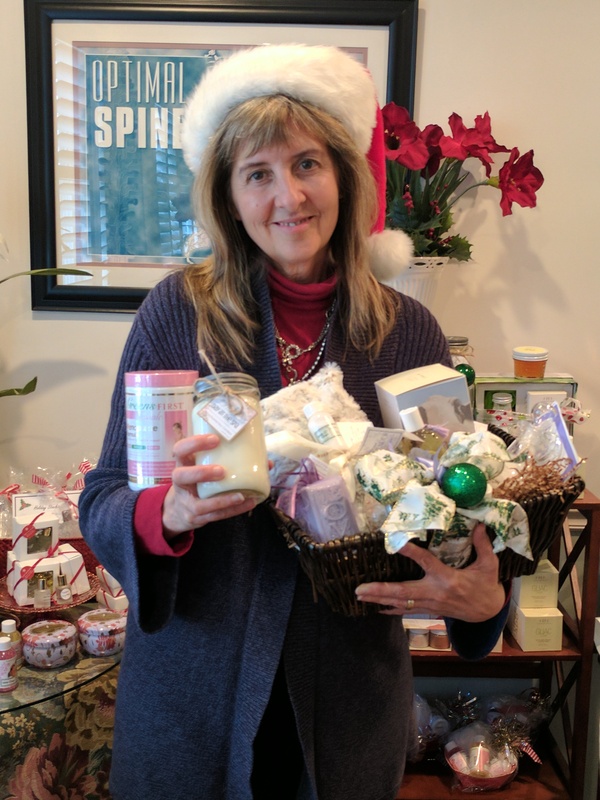 I love giving gift baskets & picking out all the items-it’s like Christmas morning all in one gift.